A great introduction to bicycle touring along an iconic New England coastline, Cape Cod & the Islands has it all. Bicycle along paths and back roads through beautiful Martha’s Vineyard, Nantucket, and Cape Cod. Explore island villages and sandy beaches, take a stand up paddle board lesson with professional instructors, and tour the city of Boston by foot. Carrying personal and group gear in panniers (saddlebags), you will become competent cyclists and adventurers while learning to operate as a self-sufficient team. 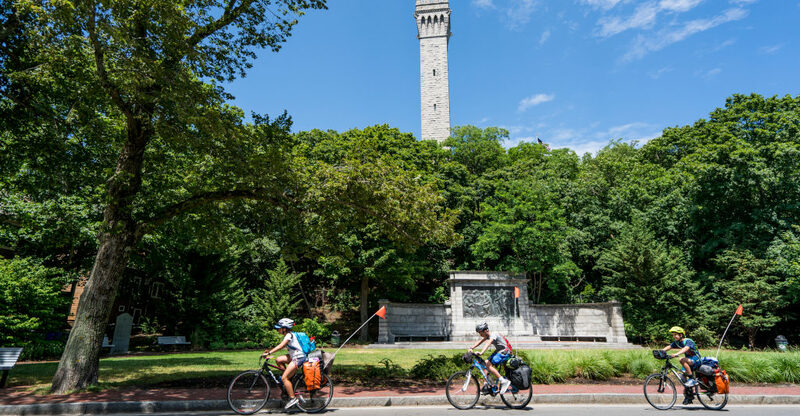 This summer bike tour is always a hit; join us and see why! Traveling by ferry, we journey to Martha’s Vineyard and Nantucket for endless island fun. Both islands are crisscrossed with user-friendly bike paths that allow us to ride with ease from place to place. There will be plenty of time off the bikes to explore seaside villages like Edgartown, Oak Bluffs & Siasconset. Spectacular sandy beaches abound, we’ll enjoy long afternoons playing in the sun and surf. We’ll also spend the better part of a fulfilling day as volunteers at a local community farm. After another scenic ferry ride back to the mainland, we’ll ride the Cape Cod Rail Trail and scenic back roads from Hyannis to Provincetown. 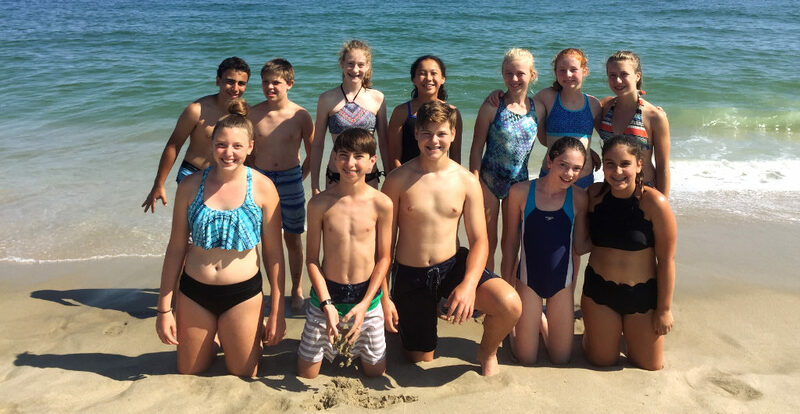 Along the way, we’ll stop near Wellfleet and have the opportunity to try stand up paddle boarding with our professional instructors, a great way to spend a summer morning or afternoon! Our last big push will bring us to the tip of Cape Cod and coastal town of Provincetown. After a morning of exploring the town by foot, we’ll take our fourth and final ferry of the trip to Boston, where we’ll spend two nights and a day exploring the sights, from Fenway Park to Boston Common and Faneuil Hall Market. We’ll enjoy a festive farewell dinner at a local restaurant and celebrate our accomplishments with laughter and stories of our fantastic 12-day adventure. How physically challenging is CI? Given a Challenge Level 3 (out of a maximum of 10), we consider CI to be a beginner cycling trip that any moderately fit, motivated student can complete with some prior preparation. We believe that CI is a great trip for students interested in trying cycle touring for the first time. It is easier than our Vermont to Montreal trip, which is one step up in challenge level. On CI, the daily mileage spans anywhere between 8 and 20 miles, averaging approximately 15 miles a day. There is also the opportunity for a “Challenge Day” in the middle of the trip that could be up to approximately 30 miles. Please note that all of Apogee’s Challenge Levels are not scientific and are subjectively calculated by the Apogee staff. Where will be child be sleeping at night? 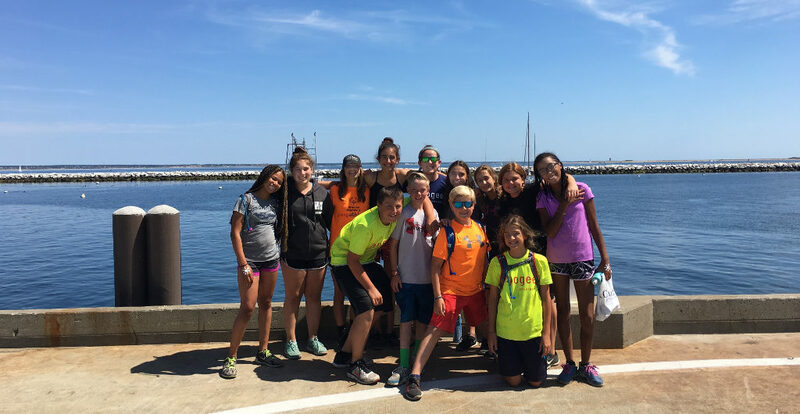 Our CI groups will be camping at established campgrounds for most nights on our trip, but of the 11 nights, we will also spend four nights indoors: two in a hostel on Nantucket and two in a hostel in Boston. Leaders will separate students by gender into tent groups, and will rotate those groups several times over the course of our trip. Students will share a tent with one or two other students. My child is new to cycle touring and has never ridden with loaded panniers. Can my child participate without previous experience? Absolutely. Apogee’s trips are designed around the concept of “achievable challenge” – anyone who has a desire to challenge themselves and possesses a basic to moderate level of physical fitness is already well-prepared. Upon your child’s enrollment, we will send you a suggested training schedule. Training beforehand (especially with panniers and weight) will directly contribute to good risk management and your child’s physical comfort. How much of the riding on the CI trip is on bike paths? Roughly 75% of the riding on our Cape Cod & the Islands trip will be on dedicated bike paths while the remaining 25% of the riding is on quieter back roads and/or roads with bike lanes. The specifics of our CI community service projects and the number of hours we volunteer varies slightly from year-to-year. In the past, we have worked with The Thimble Farm on their Island Grown Initiative on a variety of tasks including invasive species removal, plant transplanting, etc. Students can expect 3-5 hours of community service work over the course of our trip, usually in a single day. Apogee’s tuition costs are meant to be all-inclusive and include all meal, accommodation, and activity fees. The most significant additional expenses on our Cape Cod & the Islands trip will include travel to and from the Boston area, a sleeping bag and sleeping pad, a bike helmet, and a bike and panniers (rentals are available, see above).